and to use his second favorite word next to “classic”… He thought it was EPIC! Oh, it’s good to be six people! He had a mash up of his favorite things- taekwondo, Mario, people and food! Living his best life breaking boards and slicing cakes with swords. Today I’m sharing all of the DIY details and party fun!!! Photos, videos, steps and sources! This was the first birthday that I put together for my kids that was NOT at our home. 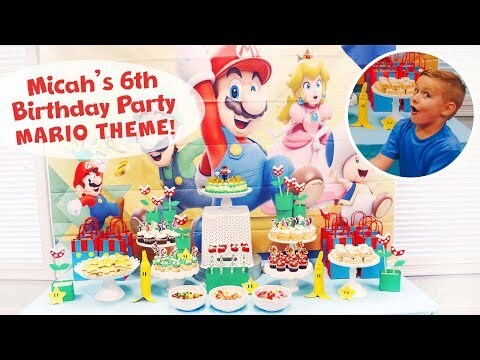 Keep on reading for all the party details and to get ideas for your own Mario Themed party! Setting up the party on location went pretty smoothly since I made a plan beforehand. to see how I liked it and to picture what cake stands I would need for the treats. I packed everything up into some boxes/bins and had them ready for the next day! together super fast, which is good because I only had 30 minutes! I knew that I needed an easy backdrop that I could set up in minutes. SO easy to set up. You can do this too! Just simplify and prep before hand. and then I used that bin to add some height to the table for the cake! I also used a metal tray from Target to add height. My cake stands are from Zurchers and Target. I have a whole collection of them that I love and use all the time. The table cloth was just a simple plastic blue one from Walmart. I doubled them up! but… it was a 6 year old party. Happy birthday to our sweet boy we adore you and all the joy you bring to our life! You’re my favorite 6 year old!!!!! If you have been here a while… you know I love a dessert table! But I also have 5 kids and work and so I try to get clever with what I plan. Most of the treats were store bought that I gave a little makeover to. My specialty! The only thing I made from scratch were the star cookies and the dipped marshmallows. All the treats were from Walmart. One stop shopping mamas! with plans to add mini marshmallows to some… and white chocolate chips to others. off the white snowflake sprinkles they had on the mini cupcakes. added the Mario themed cupcake toppers I got off Amazon. It was a variety pack and I just used a mix of them across the cupcakes. Kids love toppers! I brought three of our cereal bowls (from Target) and filled them with candy. Peach Rings for Peaches. Skittles for Yoshi. and Starbursts for the stars. The kids (and parents) slammed those bowls. haha. Something about a little scooper that makes kids happy too. I have a few different styles and sizes of them for situations just like this. I bought a box of the square Rice Krispie treats and a tube of cookie icing. You just microwave the icing for a hot second and then pipe on the question marks. I baked some of our favorite sugar cookies up and used a star cookie cuter. Micah’s heart was gonna burst when he saw those. I mean. He was pumped. I had bought some cheap floral foam blocks from Walmart to be the holders of my marshmallows! I wrapped them with green card stock paper to make them look nice. I dipped the marshmallows into some red melting chocolate. While they cooled down for a second, I sliced some mini marshmallows in half..and added them to the tops! My kids woke up to them and flipped. Mission accomplished. For the cake, I knew I needed a store-bought one that I could jazz up! I found the perfect one at Walmart and grabbed some chocolate candy coins for decorations. I had yellow stars and banana sprinkles from other projects and thought those would be perfect to add to it! He had requested candy on his cake so I used our favorite rainbow airhead xtreme bites. I got a Mario figure and that’s all Micah needed in his life. 6 year old dreams came true. onto them after and have the fun memory of their birthday party! I wanted to create some of my own chomp plants for the table! card stock paper for leaves and to wrap around the floral foam. circle a little bigger and taped to back: so I could get that shadow! Hopefully that makes sense. I’ll try to do a tutorial on it another day with photos I took of the steps! I used the same foam craft pack to make the stars on the table! I just used my star cookie cutter for the perfect shape and then added eyes with a sharpie. so I left it at two. You get the idea. haha. I wasn’t as patient! I made Mario themed favor bags with red party bags and adding blue paper to the front. I cut out yellow buttons and glue sticked them on. Micah helped me with this project! He filled up all the bags with skittles, starbursts and Mario themed party favors from Target! It was a fun day and I LOVED having it where he takes Taekwondo! Master O ran all sorts of fun games and activities for the kids. And Micah got to slice his cake with a sword and get his special black uniform! He will never forget it! I also LOVED…coming home to a clean house. haha. could join us in celebrating our Micah man! When everyone came in for cake and pizza we passed out mustaches and it was cracking us up! Micah really got into character and posed it up for us. You can see all of the parties I’ve thrown for my people over on my party page! I love throwing parties with lots of DIY details and affordable ideas.